Key Difference: The primarily difference between a solar eclipse and a lunar eclipse is that in a solar eclipse, the sun is hidden from view by the moon, whereas in a lunar eclipse, the moon is covered by the Earth’s shadow. Solar Eclipses and Lunar Eclipses are two events that thoroughly get people excited. It is not unusual to see people standing outside starting at the sky when one of these events is occurring. The universe is a marvelous thing, which is why it is no wonder that events like this seem to garner people’s attention, excitement and fascination. Among the many celestial occurrences, such as meter showers, visibility of various planets, galaxies, or other objects, passing comets, etc., some of the most popular events are the solar and lunar eclipses. All such events are popular with avid astronomy fans but solar and lunar eclipses capture the attention of everyone, astronomers, astronomy enthusiasts and even the layman. Though people know both the terms, and will have possibly seen both events in their lifetimes, they may be hard pressed to tell the difference between a solar eclipse and a lunar eclipse. The two are quite similar which is why many people are confused by which entails what. Both the solar and lunar eclipse include the Sun, Moon and the Earth, however their positions is what entails whether it is a solar eclipse of a lunar eclipse. The easiest way to remember which one is which is to note that Solar Eclipse has the word solar in it, i.e. something to do with the Sun. This is the one in which the Sun is hidden from view. Similarly, in a lunar eclipse, the moon is the focus, i.e. the moon is the one that is hidden from view. In a solar eclipse, the Sun in hidden from view by the Moon, i.e. the Moon passes between the Sun and the Earth, thus obstructing the view of the Sun. In a lunar eclipse, the Moon is hidden from view by the Earth shadow, i.e. the Earth is between the Sun and the Moon, and thus ends by blocking the light of the Sun from reaching the Moon. Lunar eclipses are much more frequent than solar eclipses because the Moon is 300 times closer to the Earth than the Sun, hence the probability of a lunar eclipse is higher. There can be a partial solar eclipse, in which only part of the sun is hidden from view, or there can be a full solar eclipse, in which the whole sun is hidden from view. 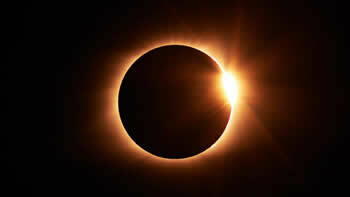 The full solar eclipse is quite rare and thus is quite popular and newsworthy when it does occur. 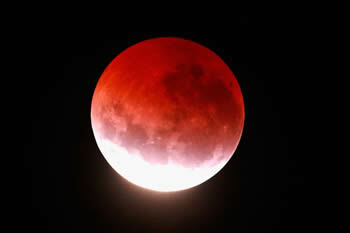 Additionally, a lunar eclipse can occur only on a full moon. It can also be a full or partial eclipse. An annular lunar eclipse is when the moon is at the furthest point in its orbit. Sometimes, the lunar eclipse causes the sunlight to refract which causes the Moon to take on a reddish hue, this is also known as a Blood Moon. Another difference between the two is that a lunar eclipse can last for a few hours at least, while a solar eclipse lasts only for a few minutes, which is another reason why solar eclipses are more popular than lunar. Also because the lunar eclipse can be seen from anywhere where it is night while the solar eclipse can only be seen from a particular location where the Sun and Moon are perfectly lined up. This is particularly true for a full eclipse; while only the people where the Sun and Moon lines up will see a full eclipse, people further away will see a partial eclipse, whereas people even further away will see nothing. Lunar eclipses occur only at night, while a solar eclipse occurs during the day. It is quite safe to see the lunar eclipse directly with the naked eye, but it is not recommended to see the solar eclipse directly. One should use some protective eyewear to view the solar eclipse otherwise, it can damage the retinas. From anywhere there is night. Cannot be seen with the naked eye. Need special glasses or some form of eye protection. Seen with the naked eye. No equipment needed.